Welcome to the Offshore Base Cuxhaven website! As the supplies of oil, gas and coal will run out in the foreseeable future, people all over the world are searching for new energy sources. The power of the wind, however, will never run out, and more and more countries are pursuing this opportunity. Europe is in the lead in this pursuit, and one of the largest projects started a few years ago in Cuxhaven. With substantial support from the State of Lower Saxony and the EU, an infrastructure was created here to build and ship all of the components necessary for offshore wind turbine generators. In recent years, more than € 80 million has been invested in the infrastructure of the Offshore Base Cuxhaven, and in addition, private investors in the offshore industry have invested more than € 100 million in Cuxhaven during 2007 and 2008. Additional private and public investments are forthcoming in the next few years. Cuxhaven with its location directly at the mouth of the Elbe and its deep water port has a long maritime tradition. With its efficient port facility, it is therefore a central position in the value-added chain of offshore wind energy. 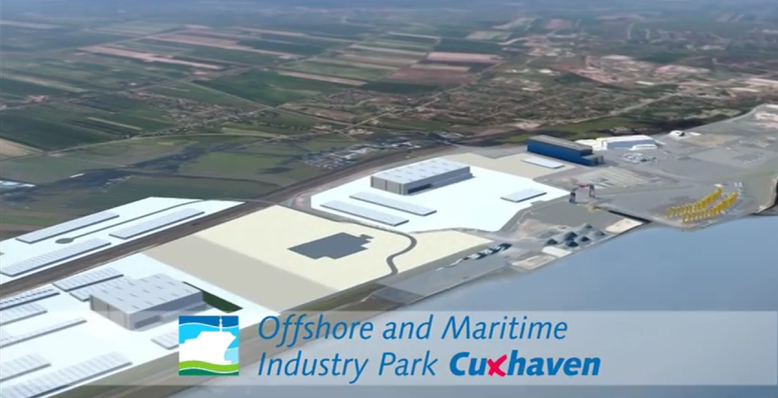 The City of Cuxhaven has aligned itself optimally to the economic opportunities of renewable energy, and with a number of unique characteristics, has positioned itself as the leading offshore base port on the German North Sea coast. Along with its central location to the offshore wind parks in the North Sea and the Offshore Base Port directly on the Elbe with water depths sufficient for seagoing vessels, Cuxhaven also has an Offshore heavy load platform in the direct vicinity of the offshore base since mid-2007. In addition to the Cuxhaven location, there are industrial and commercial zones near the port with a high level of maritime competency including comprehensive offerings for "Professional and vocational qualification" providing an optimal base structure for activities of the offshore industry.